At first I pay the Pag-IBIG contribution by sending remittance to my family in the Philippines; later on, because of the many reasons not to ask a family member to do it for me anymore, I decided to pay the Pag-IBIG contribution online. As of this writing, I made 13 Pag-IBIG contributions online . I am planning to buy a house and lot through Pag-IBIG loan. At first I intend to pay a low monthly mandatory savings, but when I checked the price of house and lot in the Philippines I was startled. I couldn’t believe how a real estate is so expensive. 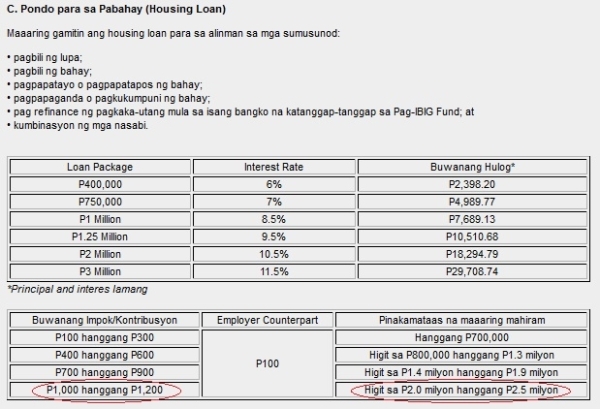 So if you want to apply for a higher Pag-IBIG loan, you can refer to the table above and in the FAQ of the Home Development Mutual Fund Law of 2009 for more information. Now that you have decided how much to contribute, let’s get started. The PESOPAY PAYMENT SERVICE page is displayed. Choose whether you want to pay with a credit or debit card. I choose to pay with my Amazon.ca VISA Home Trust Preferred Visa because there’s no foreign conversion fee unlike other credit cards. For all foreign transaction, either online or in person, I use the Amazon VISA. Enter your credit card information. I haven’t tried to pay through debit card because I want to collect points with every transaction using my credit card. Earn more with higher interest rate. As a Pag-IBIG member, you can also register to the Modified Pag-IBIG II Program. For OFWs, you can pay online via PayPilipinas. Check your contribution online aside from saving the soft copy of the receipt. Isn’t it easier to pay Pag-IBIG contribution online than ask a favour to your family in the Philippines. You can also collect points (credit card) and pay on or ahead of time. Tip: Before paying online, use XE Currency Converter to find out the current exchange rate so you can have an idea how much is the fee in Canadian dollar. You can also watch the video of the transaction from the Pag-IBIG YouTube channel. Let me know if paying online works for you. Or share other methods of paying the Pag-IBIG monthly contribution overseas. Hi, can this method be also used when paying the MP2? Hi Zel. It isn’t possible on the Pag-IBIG website. But check the post for an update about PayPilipinas so you can pay the MP2 contribution online. Hi, Tnx po sa pag reply. Itra-try ko po yung pay pilipinas ang laki lng talaga ng charge nila. At i-check ko din kung pwd s BPI. Baka may idea po kayo kng paano gawin kung thru BPI? Good luck cara. I’m not sure kung pwede magbayad through BPI. For now, I can’t pay through my PNB account but maybe in the future it will be possible. Hi po, tnx sa blog nyo kasi nghahanap talaga ako ng mga option na pweding mgbayad online sa Pag-ibig, SSS, at Philhealth kasi ayaw ko na din na maka-abala sa pamilya ko sa pinas. Tatanong ko lang sana kung yung online payment facility s website ng Pag-ibig pwede din sa monthly amotrization ng bahay kasi ang nakalagay lng MONTHLY MANDATORY SAVINGS? tnx. It’s only for monthly savings as of now. For the amortization, you’ll have to pay through a Philippine bank account. Ken for those working as an employee in the Philippines, the mandatory savings’s computation is done by the company. But for OFWs, we can pay a minimum of Php 500.00. It’s up to us to pay the minimum or add more. We have the choice. Is that possible as an employee? Can you ask your employer to deduct more each payday? I would love to know your thoughts. In a nutshell, let’s keep saving whether it’s called savings or contribution. It’s a fund for your future self so make it a priority. I’m sorry, but I think that you’re a bit misguided on PAG-IBIG rules on housing. If you have to avail of housing loan amounting to P2M or P2M, you may opt to do so only on the month the loan is approved. This means that you can pay lower contributions prior to loan availment. Besides that, not all who contribute 1,000 a month can qualify for a housing loan of P2M to P2.5 million. That will still depend on the appraisal of the property and the member’s financial capability to pay the loan. Hence, you can’t simply tell an ofw earning a gross salary of P15k a month to contribute P1,000 per month to be eligible for a higher housing loan amount. Have you apply for a housing loan in Pag-IBIG, Vichie? It seems that you have a lot of valuable experience to share. And thanks for the tip. I find it daunting for OFWs to apply for a Pag-IBIG housing loan. There are so many requirements that I can’t do myself that’s why I decided to buy a house in cash. No paperwork and debt interest rate. As for the contribution, you are right that meeting the contribution will not guarantee a higher housing loan amount. Financial capability and property appraisals are some of the factors that will be consider in the loan approval. Qualified or not, the contribution can go towards the retirement fund as part of the retirement plan. Win win. Yet, it is still best to have passive income to cover the expenses in retirement.